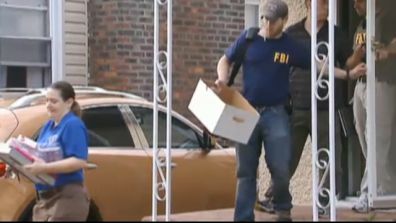 The FBI executed search warrants at the New York homes of three suspected members of notorious hacking group Anonymous early Tuesday morning. More than 10 FBI agents arrived at the Baldwin. The agents spent an hour and 40 minutes at Jordan's house, other agents investigated a second Long Island, N.Y., home and one in Brooklyn. The targets of the FBI searches are all in their late teens to early 20s. Search warrants were part of an ongoing investigation into Anonymous, which claimed responsibility for attacks against a variety of websites including Visa and Mastercard. Anonymous is a loose collection of cybersavvy activists inspired by WikiLeaks and its flamboyant head Julian Assange to fight for "Internet freedom" along the way defacing websites, shutting down servers, and scrawling messages across screens web-wide.